Ransomware infections are developed very actively by cyber criminals, so specialists detect new infections almost every day. Balbaz Ransomware is the ransomware infection they have come across the most recently. It comes in two different versions, but they do not differ much from each other. They both encrypt users’ personal files and then demand a ransom, so you will surely discover your personal files locked no matter which of the versions of this ransomware infection you encounter. A bunch of encrypted files is only one of the symptoms indicating the successful entrance of this ransomware infection. If Balbaz Ransomware is really the one responsible for locking them on your computer, you will also see a red window opened on your Desktop, a changed Desktop background, and a .txt file READ_IT.txt on Desktop. You will be told that there is a way to unlock files quickly – to purchase a decryption tool that costs $200 from cyber criminals. Victims are only given 7 days to make a payment, but you should not even consider transferring your money to malicious software developers. There are two reasons why you should not do that: 1) there are no guarantees that you could unlock files after sending the required money; 2) users encourage cyber criminals to develop more malware by giving them the money they want. Therefore, the piece of advice we have for you is to delete this infection from the system as soon as possible. Balbaz Ransomware is a threat based on the engine of the HiddenTear open-source ransomware, so there is no doubt that it will encrypt your files if it ever enters your computer. You could not only open them, but you will also see them all having a new extension .WAmarlocked. 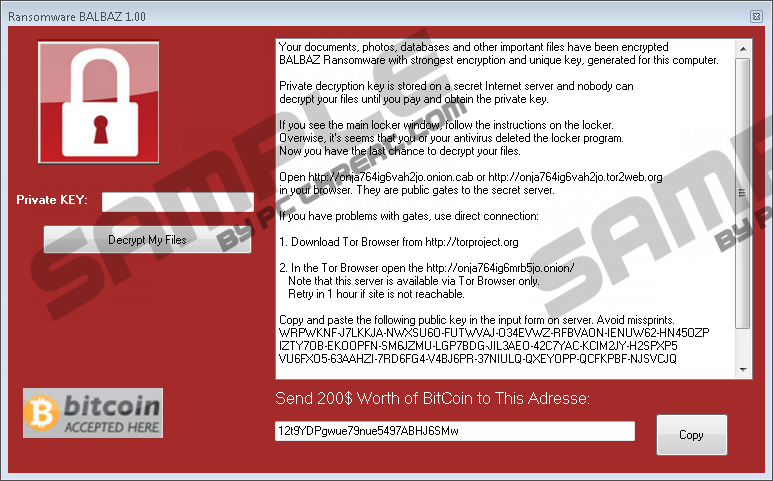 A red window with instructions and a .txt file belonging to this ransomware infection both tell users that they need to send a ransom in the Bitcoin digital currency in order “to get decryption passcode.” It costs $200, but the price might vary. No matter how much it costs, do not purchase it from cyber criminals by any means because you might not be even given the promised tool for decrypting files. Also, you should not give malware developers your money because you might be able to get files back without special software. The only way to do this is to restore files from a backup. If you have never backed up your personal files, delete the ransomware infection from your computer and wait until specialists crack the key used and release a free decryption tool. We, unfortunately, cannot promise that this will happen in the near future. The majority of victims of ransomware infections do not know how they have entered their computers because they usually do this unnoticed. Balbaz Ransomware is one of these infections that illegally enter computers. According to researchers at pcthreat.com, it should be spread via spam emails primarily. Some users already know that spam emails might contain malicious applications, but they still open these emails and their attachments out of curiosity. In some cases, these malicious attachments are even masqueraded as important documents to make sure that they are opened by users, so we cannot blame them. As you already know, Balbaz Ransomware changes Desktop wallpaper, opens a window with instructions, and encrypts files following the successful entrance; however, these are definitely not the only symptoms showing that this infection is inside the system. More experienced users can also come across a new file local.exe in %HOMEDRIVE%\user\Rand123 and ransom.jpg$ or ransom.png$ in %HOMEDRIVE%\user. You will need to delete those files to remove the ransomware infection from your computer, so we cannot promise that it will be a piece of cake to erase it. Read the last paragraph carefully to find more about the removal of this malicious application. You can either remove Balbaz Ransomware manually or automatically. If you make a decision to erase this infection yourself, you should let our manual removal guide help you because you cannot leave a single component of this infection on your computer. If it is not removed fully, it might revive and strike again. If you are not experienced in malware removal at all, you should let an automatic malware remover help you – you will be sure that the ransomware infection and all other active threats have been deleted from your system completely and can no longer cause problems after a single scan with an automatic scanner. Right-click it and select Delete from the menu. Close Registry Editor and tap Win+E to open Explorer. Open %HOMEDRIVE%\user\Rand123 and delete local.exe. Go to %HOMEDRIVE%\user and delete ransom.jpg$ or ransom.png$ from this directory. Quick & tested solution for Balbaz Ransomware removal.